I"m learning Arcgis. I have a DEM that I did contours from in Analyst. It gave me the contours, set at 1. Where do I set that it means 1 FOOT intervals? Also, it's showing them in sea level altitude (179-200). I need them to say 1,2,3,..etc. I added a field, LocalHt, and trying to do a field calc on it. [localht]=[contour]-179 but it doesn't work. all values show zero. I tried Pyton script, but don't get the syntax right in it either. My goal is to label contours at 1' intervals, and have them shown throughout the area (about 3 acres). For labeling, you could check Labeling using the Contour Placement style—Help | ArcGIS for Desktop (Maplex labeling Engine used). It indicates where you put in the contour interval (where you would specify 1 foot). After that, you can properly label them. I tried the Maplex engine. I have some elevations on one part of the area but not the area I need. I tried the repeat feature, but I don't know how far apart 'map points' are or if 'inches' or 'mm' refers to ground length, screen length, map length, or what. What is it using for reference length? I click the contours button graphic, and I don't get the popup. I get a crosshair and can click on the map and create one single contour. I have to 'undo' to get it to go away, and there's no way to manipulate several of them (no entry in the list on the left) to change colors, interval, etc. Why no popup? Could you explain with screenshots? 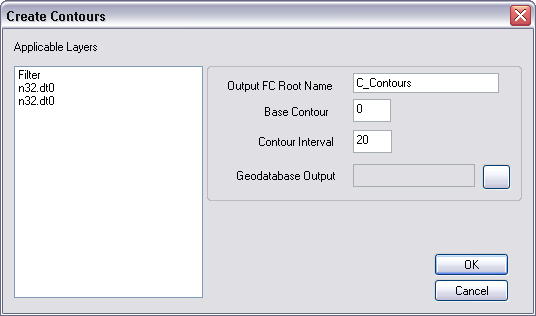 Could you attach the screenshot of the attribute table of the Contours layer? Jayanta, I will when I get it working. I now am fussing with the esripyfldr error and can't uninstall or reinstall. Working on it. thank you both. As far as the original question, I have found that the expression window placed the name of the column for me and I didn't have to include it in the expression. I have also found the Maplex engine for labeling. I'll try that. After my reinstall, seems things are working better. I got it to repeat every 10 map units.